Blog Should unicorn hunters focus on India? India’s track record on producing “unicorns” – tech companies with a value of USD1 billion or more – is often compared unfavorably with that of China. Entrepreneurs of three fast growing tech platforms in India speak at the AIC. Indeed, Indian tech companies could be at a watershed moment. The hype about the digital disruption of consumer businesses in India has often raced ahead of the reality. But this could be changing, driven by rising smartphone usage, cheap data plans and growing awareness in non-urban areas. 2018 looks to have been a breakthrough year: total internet users in the country passed the 500mn mark, and of some 493mn regular users – of which 97% access the internet on their mobile device –200mn reside in rural areas. Consequently, many local digital players are scaling faster than ever before, disrupting traditional sectors including banking, insurance, logistics – even sports. A panel at the 22nd Credit Suisse Asian Investment Conference highlighted three of the fastest-growing tech platforms in the country: Zomato, which began as a restaurant search and discovery portal and has grown to include ratings, loyalty programmes and delivery services, with 120mn users per month across 24 countries; Dream11, a fantasy sports portal with 54mn users; and Lendingkart, an SME loan company serving over 30,000 small businesses across India. Though operating in diverse fields, the trajectories of the three highlight positive trends in the potential for disruptive internet-driven companies in India. First is the potential to scale. “In India, there’s 800mn people that watch sports on TV; there’s about 400mn that consume sports online. We have 54mn users so there’s huge headroom for growth,” said Harsh Jain, CEO and Co-Founder of Dream11. Gaurav Gupta, Co-Founder and COO of Zomato, had some equally mouth-watering stats, estimating that out of the 100 meals someone might eat in a month, on average for people in India just 3 to 4 would come from a restaurant. He contrasted the city of Melbourne, Australia, where he claimed 40 to 50 meals per month would come from a restaurant. Gaurav Gupta, Co-Founder and Chief Operating Officer of Zomato discusses the opportunities for growth in India with other panelists at the AIC. 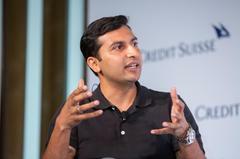 Harshvardhan Lunia, Co-Founder and CEO of Lendingkart, sees an addressable market of around 60mn people running or working for small businesses that are underserved by traditional lenders – of which around 11mn are potential borrowers – typically young and operating as part of a supply chain. With a USD10,000 average loan size, that gives a potential loan market worth over USD100 billion. Another reason the story could be changing is an awareness of the need to grow sustainably, changing the traditional “earn versus burn” narrative where growth at all costs has trumped returns. Though for most that might be a way off yet, the consensus is that growth has to be profitable, and business models that aren’t carefully focused on returns are less and less likely to find willing investors. Byju Raveendran, Founder and CEO of BYJU’S also discusses the positive growth his tech platform has seen in India during his address. 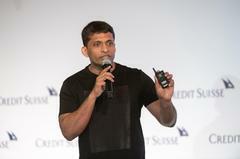 Another speaker at the AIC, Byju Raveendran, epitomised the potential, describing the growth of his eponymous ed-tech disruptor and unicorn BYJU’S. The company provides targeted video and games designed to make conceptual learning easy and fun – and has racked up 33mn users, 2.3mn paid subscribers and is adding 140,000 paid users every month. And, significantly, renewal subscribers have an 85% contribution margin. What also makes BYJU’S stand out is the penetration into second-tier and lower-income regions: some 76% of its users are outside the metropolitan areas, and 41% of paid users have an annual household income of between USD2,000 and USD8,000. Raveendran expects to get USD1 billion in revenue from India alone in the next 18-24 months, making it a “new” unicorn by Gupta’s redefinition. With more and more Indian disrupters proving growth and profitability are possible across India, unicorn hunters are advised to train their sights on the country.